POPCORN MACHINE POPPER PARAGON CLASSIC POP CLP-20 #1120810. Styled just like the poppers you see at the local movie house, the Classic Pop line has a bright cabinet and classic graphics that fit almost any décor. Each full-featured machine pops delicious, theater-quality popcorn in 3-5 minutes, is easy to use and easy to maintain. Paragon's American-made Classic Pop popcorn machines are unparalleled in quality and workmanship and are comparable to commercial popcorn machines you find at the movie theaters. If you are looking for the highest quality popcorn machine in the market, you will find it in the Classic Pop. 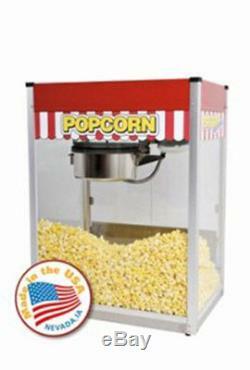 The Classic Pop 20oz popcorn machine operates on a 30 amp 120 Volt circuit (You need a NEMA Style 5-30R Outlet). This machine is ideal to use in schools or any environment that needs lots of popcorn. This popper will produce 400 servings per hour. This full-feature popcorn machine uses a gas spring assisted kettle for easy unloading, four-switch operation, kettle "ready" lights and a Hard-coat anodized aluminum kettle for superior performance and ease of cleaning. The heated warming deck will keep popcorn warm and fresh for long periods of time. One serving will produce enough popped popcorn to fill approximately sixteen 1-oz bags. DIMENSIONS: 29 1/4"w x 21 1/4"d x 36 1/2h 135lbs SPECS: Plugs into a NEMA Style 5-30R Outlet This machine is 100% made in the USA! Pops 400 one-ounce servings per hour. A high-volume machine ideal for larger venues including: convention centers, arenas and amusement parks. The item "COMMERCIAL THEATER 20 OZ POPCORN MACHINE POPPER MAKER PARAGON CLASSIC POP CLP-20" is in sale since Thursday, June 30, 2016. This item is in the category "Business & Industrial\Restaurant & Catering\Vending & Tabletop Concessions\Tabletop Concession Machines\Popcorn". The seller is "concessionobsession" and is located in Nevada, Iowa. This item can be shipped worldwide.